Somewhat like sausage, but thinner. 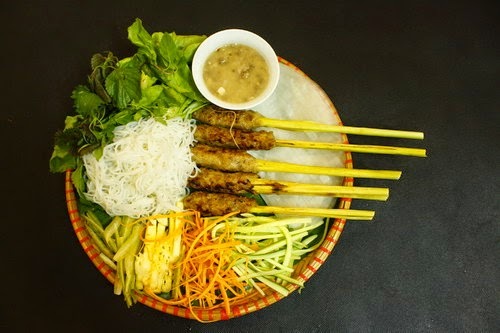 Nem lui is finely grounded beef and pork with garlic, chili grilled then put on a lemongrass skewer. But nem lui is not eaten alone. It is a part of a roll, which also contains lettuce, herbs, shredded carrots, pineapple, cucumber and sometimes with banh xeo (sizzling cake). After being rolled up altogether, it is dipped into a thick brown sauce with peanuts, shrimp taste, garlic and shallots. This is perhaps the most famous food of Hue. 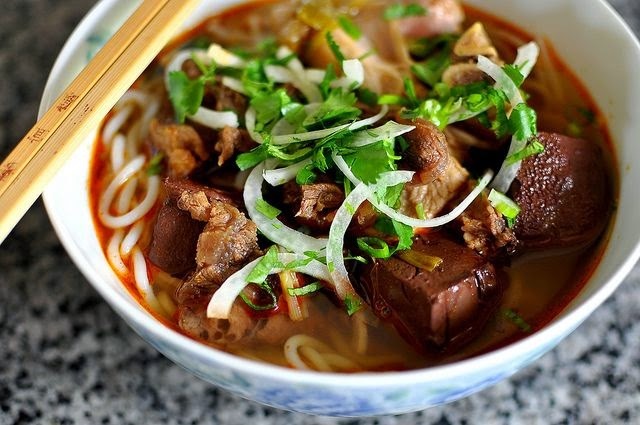 In fact, it is so famous that if there’s a list of the 5 most popular dishes in Vietnam, bun bo Hue still has a very high chance of getting its name there. If pho in Hanoi is sweet and aromatic in its broth thanks to the use of star anise and cinnamon, bun bo Hue is particularly spicy because of its reddish broth that is made of chili, lemongrass, ginger and shrimp paste. Furthermore, bun bo Hue’s noodles are round unlike pho’s noodles which is flat. To go with the spicy broth, we have beef, meatballs, congealed pig blood, pork shanks and/or knuckles. A basket of fresh herbs is served as side dish. The main element of this dish can be easily explained in the name itself, with com is rice and hen is clam. But only rice and clam doesn’t make an iconic Hue food. 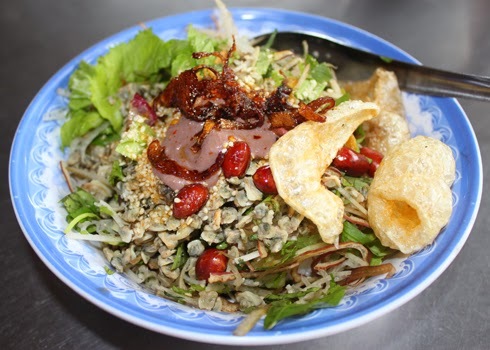 A bowl of com hen also contains crispy pork cracklings, glass noodles, peanuts, bean sprouts, fried shallots and herbs. As an alternate, you can also replace rice with rice vermicelli but now the dish is called bun hen. 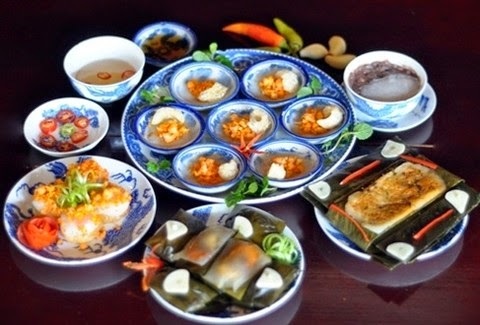 This term is often used to call different kinds of banh (cakes) in Hue. The three most famous banh are banh beo (steam rice cakes topped with shrimp, pork cracklings, shallots and herbs), banh loc tran (pork, shrimp and chopped onions in condensed rice cake, wrapped altogether in banana leaves), banh khoai (like banh xeo in Southern Vietnam but smaller and thicker, pan-fried then stuffed with pork belly, shrimp, scallions and bean sprouts). Each banh has its own dipping sauce, but people often order for more than one kind of banh. Of less popularity is banh ram and banh nam.